The STI benchmark consists of the 30 largest and most active stocks traded on SGX. The next ﬁve largest and most active stocks make up the STI Reserve List. This list is used in the event one or more STI constituents are deleted before the next quarterly review. 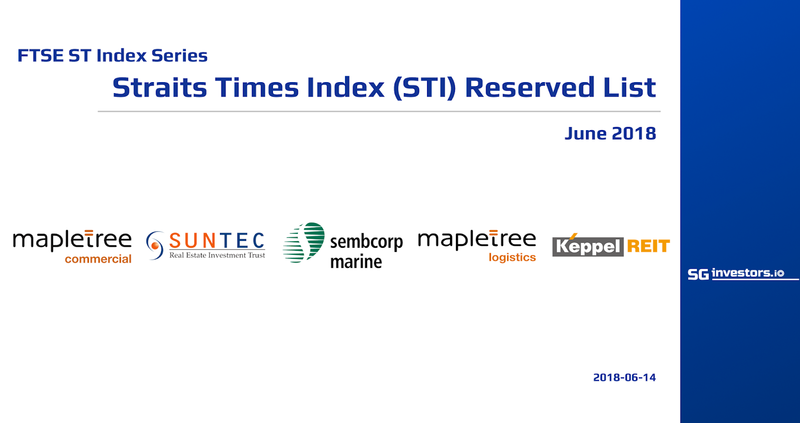 The current STI Reserve List stocks are Suntec REIT, Sembcorp Marine, Mapletree Commercial Trust, Keppel REIT & Mapletree Logistics Trust. The list has changed completely from the end of 2013, with four of the ﬁve then STI Reserve stocks since joining the STI. The current ﬁve STI Reserve stocks have averaged 10% total returns over the past 12 months, taking their average ﬁve year return to 29%. Four of the ﬁve stocks are REITS that currently maintain an average indicative dividend yield of 5.7%. The Straits Times Index (“STI”) is a highly competitive and diversiﬁed benchmark index. The 30 constituents have foundations spanning three centuries cover multiple Sectors while maintaining an exciting balance between local and regional economic exposures. Following the recently quarterly review of the FTSE ST Index Series there are no changes to the STI constituents eﬀective 18 June. The STI Reserve List also remains unchanged. The STI Reserve List is used in the event that one or more STI constituents are deleted during the period leading up to the next quarterly review. A sporting colloquial term for the STI Reserve List could be the bench that serves the bigger STI benchmark. These ﬁve stocks have a combined market capitalisation of S$21.4 billion which means an average size of S$4.3 billion for the ﬁve stocks. Real Estate Investment Trust (REITs) make up as many as four of the ﬁve stocks of the STI Reserve List which exempliﬁes the recent strengths of this segment since it was established in 2002. Sembcorp Marine was formerly in the STI and removed from the benchmark in September 2016. Since its removal was announced cyclical recoveries have seen the Sembcorp Marine share price rally 66.0%, with total returns of 68.8% compared to a 27.2% total return for the STI. Back in April 2014, the STI Reserve List comprised of Ascendas REIT, Keppel Land, UOL Group, CapitaLand Commercial Trust and Yangzijiang Shipbuilding Holdings. Over the past four years Ascendas REIT, UOL Group, CapitaLand Commercial Trust and Yangzijiang Shipbuilding Holdings have all joined the STI, through either activation of the Reserve List or having joined at scheduled rebalances. The exception was Keppel Land which delisted after Keppel Corp acquired the remaining shares of Keppel Land in 2015 at a 25% premium to the stock's pre-oﬀer one-month VWAP. Since April 2014, SATS and Venture Corporation have also joined the STI, with SATS joining the STI in September 2015. At rebalances, Jardine Matheson Holdings and Jardine Strategic Holdings have also left the STI, yet re-entered the STI due to comparative pick-ups in their trading activity. Other stocks such as Yanlord Land Group have also since joined and left the STI Reserve List without joining the STI. Venture Corporation's share price soared from S$9.88 at the end of 2016 to S$20.47 at the end of 2017. This placed Venture Corporation as the largest capitalised stock of STI Reserve List when Global Logistic Properties came out of the STI eﬀective 5 January 2018. Venture Corporation had only been in the STI Reserve List since September 2017. The recent performances of the current STI Reserve List are tabled below. Source: Bloomberg & SGX StockFacts (data as of 13 June 2018). As discussed above, the STI Reserve List is used in the event that one or more of the STI constituents are deleted during the period up to the next quarterly review. As detailed in the STI Ground Rules (click here) when a stock is going to be removed from the STI the vacancy will be ﬁlled by selecting the highest ranking security by full market value in the STI Reserve List as at the close of the index calculation two days prior to the deletion. There are further qualiﬁcations for the framework of the STI Reserve List in the case as Mergers, Restructuring and Complex Takeovers as described in Section 6.4 of the STI Ground rules.